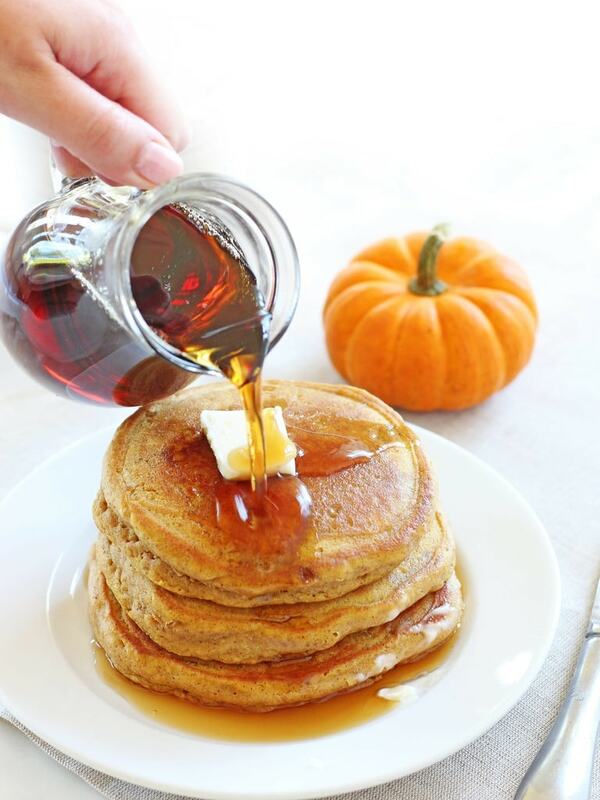 Fluffy pumpkin pancakes taste like clouds of pumpkin pie! This easy recipe is a must try for a festive fall breakfast. Ahhh, fall is here ladies and gents. 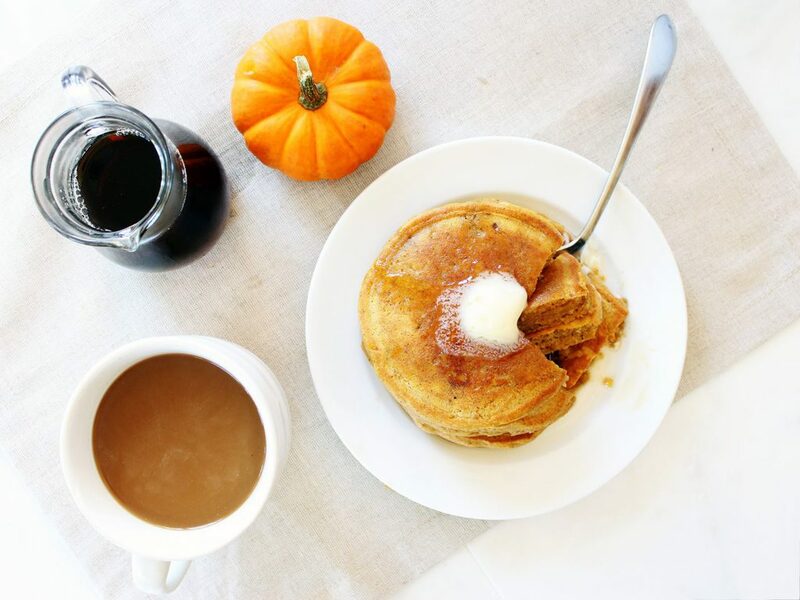 And I don’t know about you, but for me crisp fall mornings call for a mug of hot coffee and fluffy pumpkin pancakes. Roll on out of bed, throw on a cozy sweater and embrace the season. This time of year I feel especially lucky living in New England. I get the full fall experience. Yep, I’m talking pumpkin picking, leaf peeping—the whole shebang. Now I’m not sure this comes with the territory, but either way this New England upbringing has made me a huge fan of pumpkin spice flavored food and drinks. Enter pumpkin spice pancakes and pumpkin spice coffee. These two items are what I consider the ultimate fall breakfast duo. When it comes to how you take your morning coffee, I’m all about a shot of creamer. Just enough to cut the bitterness of coffee and add some flavor. And when fall arrives, I eagerly wait the arrival of pumpkin spice flavored coffee creamers. So of course I was overjoyed when I saw International Delight® Pumpkin Pie Spice Coffee Creamer on the shelves. Well, with coffee on my mind, I was thinking breakfast foods and started craving pancakes. To be honest, I’m usually a fruit and yogurt type of gal in the morning, but every now and then I treat myself to a stack of fluffy pancakes. This weekend I wanted those pancakes to be pumpkin spice and my family did not argue. Of course, they never argue anyway when I offer to make breakfast! I woke up, made a fresh pot of coffee and got to work with my pancake batter. 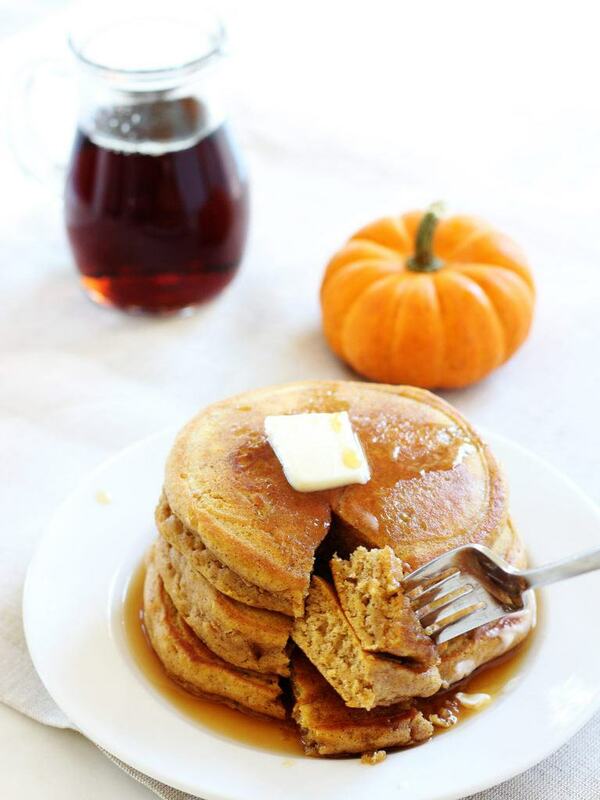 There are three components that makes these pancakes the ultimate fluffy pumpkin pancakes. One, there is real pumpkin purée in the mix. Two, a medley of fall spices are whisked in for flavor. Three, pumpkin pie spice coffee creamer makes those flavors come alive. Yes, coffee creamer in pancakes is kind of a secret ingredient, especially when it’s flavored coffee creamer. You can swap it in where recipes call for milk. And not only does it keep the pancakes moist, but also gives them added flavor. After pouring the pumpkin pie spice in my coffee, it went straight over to the measuring cup and into the batter. Needless to say these pumpkin spice pancakes were a hit with my family. We were sitting around the kitchen table eating stacks of pancakes and sipping our morning coffee. I’m pretty sure all of us had seconds, which doesn’t usually happen at breakfast, but it did with these pancakes! In a large bowl, whisk together flour, light brown sugar, baking powder, salt and spices (cinnamon, ginger, nutmeg, cloves). Set aside. 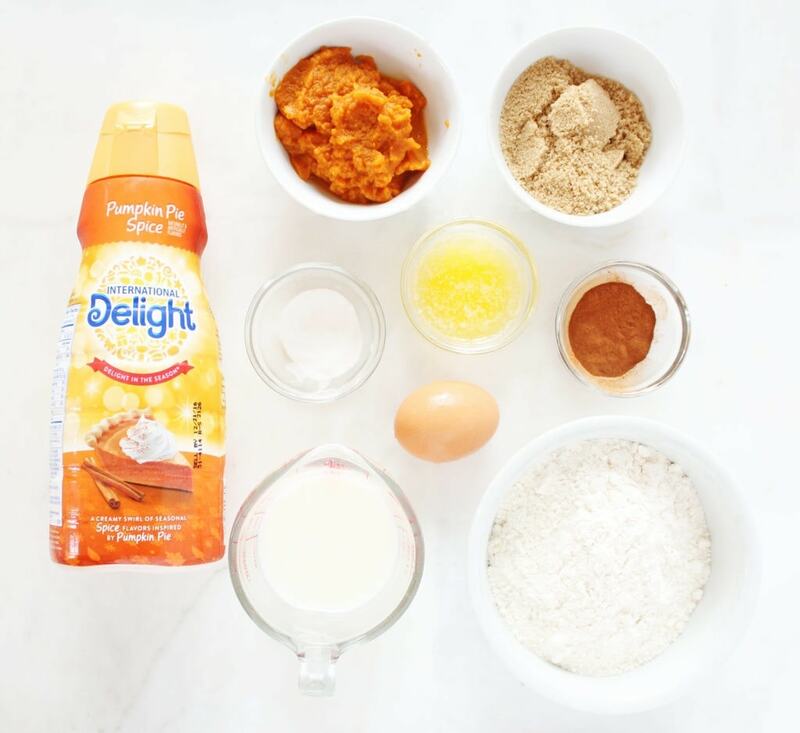 In a medium bowl, mix together milk, pumpkin pureé, butter and egg until combined. Fold pumpkin mixture into dry ingredients and stir until fully incorporated. Pumpkin spice coffee creamer can be substituted with whole milk or low-fat milk. We love a stack of fluffy pancakes in this house! These pumpkins ones look fab, I’ve never made pumpkin flavoured ones before but I am definitely going to now! Oh yum! This looks so tasty and I absolutely love how you photographed them, just stunning! These sound scrumptious! We don’t have the creamer here in Australia, but I do have the spices and some conveniently roasted and mashed Pumpkin, so I think I’m all over this! Thankyou. Mimi, they are so good! 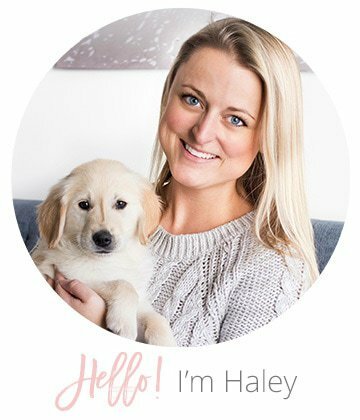 You’ve got to try them. You can substitute the milk for creamer without a problem! 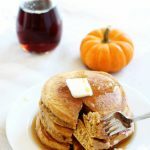 I’ve tried many pumpkin spice pancakes and never found one that wasn’t off, somehow! This is a genius idea! 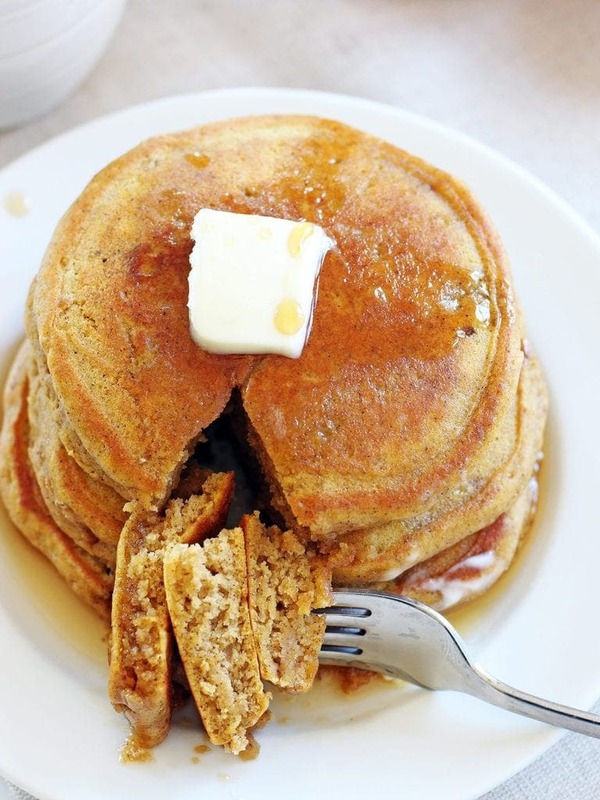 Mile high fluffy pumpkin pancakes! Awesome! This is a great reminder! Pumpkin everything sounds delicious! Personally I do not stock creamer but will substitute as previously mentioned! I made these and they were fantastic! I will be making these many, many more times :). I love the addition of the coffee creamer! That makes me so happy, Eileen! Glad you enjoyed the recipe.